I see something with FormServer.aspx. Why do I see this difference? I tried playing with the open in client or browser setting and client integration settings bu no luck. On my second farm I have InfoPath designer installed for development purposes. When InfoPath is installed, and you open the site in IE, it checks if InfoPath is installed. 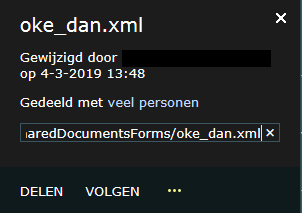 When installed you get screenshot 1 (with xml path) and it is opened in InfoPath. When InfoPath is not installed it automatically assumes you use InfoPath form server and you see the formserver.aspx page url. This also works together with the library setting open in client or browser. In Chrome you always get the formserver.aspx because the detection if InfoPath is installed only works in IE. 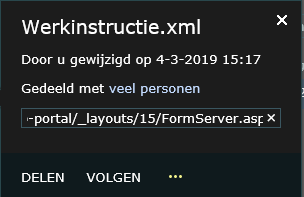 I have done a test in my environment, the entire path of my form is shown in the callout menu of form library. Try to create a new form library in the farm which shows FormServer.aspx, compare whether all form libraries just show FormServer.aspx. Not the answer you're looking for? Browse other questions tagged sharepoint-enterprise infopath forms-services forms-library or ask your own question.